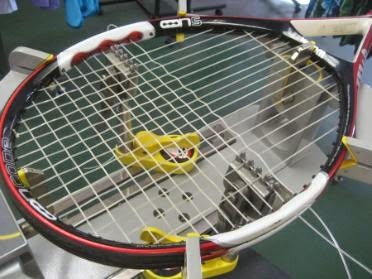 Clean the machine clamps prior to stringing natural gut strings and about every 5 – 10 rackets in general. If you string frequently than cleaning the clamps once a day before you start would be sufficient. The reason behind this tip is consistency and it helps in keeping your string from slipping in the clamps. Many tennis strings on the market have a protective coating that’s oily, some strings more than others, and keeping this on your clamps can be detrimental to your clamp performance. I will generally use rubbing alcohol and a cloth or dip a toothbrush in the rubbing alcohol and go across the inside of the clamp area that holds the strings, you can always use a clean cloth after to dry it quickly but generally the rubbing alcohol drys quickly on its own. It is important to do this as a proactive step and not reactive once your strings slip. If your strings slip while stringing a racket than you need to start over and use a new set of string, the string has been compromised and the slippage has shortened its life even if you can’t noticeably tell.